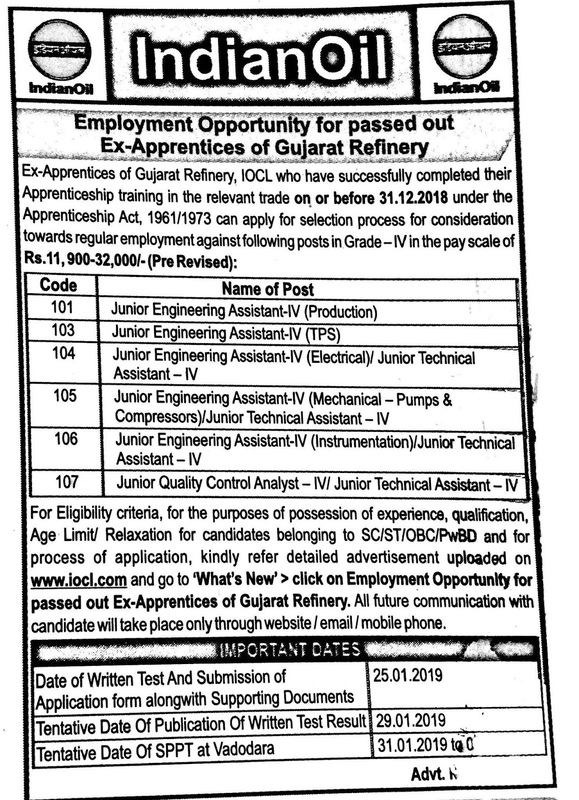 Indian Oil has published Advertisement for below mentioned Posts 2019. Other details like age limit, educational qualification, selection process, application fee and how to apply are given below. 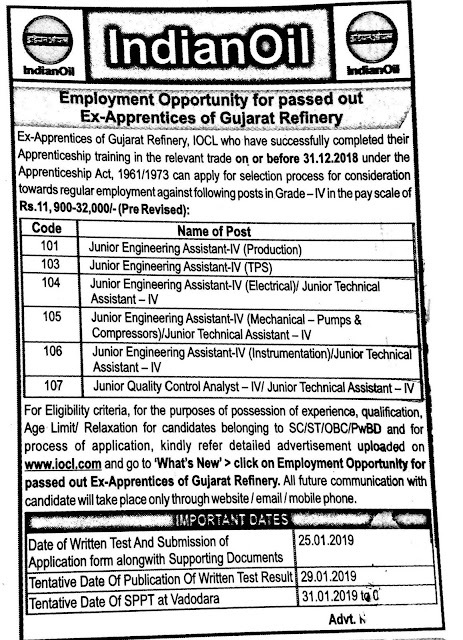 Junior Engineering Assistant-IV (Production): Ex-Apprentices of Trade Apprentice (AOCP)/ Technician Apprentice (Chemical): 3 years Diploma in Chemical/ Refinery & Petrochemical Engg. or B.Sc. (Maths, Physics, Chemistry or Industrial Chemistry) from a recognized Institute/ University with minimum of 50% marks in aggregate for General & OBC candidates & 45% in case of SC/ST candidates against reserved positions. Junior Engineering Assistant-IV (TPS): Ex-Apprentices of Technician Apprentice (Mechanical)/ Technician Apprentice (Electrical): 3 years Diploma in Mechanical or Electrical Engg. from recognized Institute/University with minimum of 50% marks in aggregate for General & OBC candidates & 45% in case of SC/ST candidates against reservedm positions. Subject to the condition below: Candidate selected under Category above and posted in Boiler Operations shall undertake to acquire Boiler Competency certificate within four years of joining the services of the Corporation. Junior Engineering Assistant-IV (Electrical) / Junior Technical Assistant – IVL: Ex-Apprentices of Technician Apprentice (Electrical): 3 years Diploma in Electrical Engineering from recognized Institute/ University with minimum of 50% marks in aggregate for General & OBC candidates & 45% in case of SC/ST/PwBD candidates against reserved/identified for PwBD positions. Junior Engineering Assistant-IV (Mechanical – Pumps & Compressors) / Junior Technical Assistant – IV: Ex-Apprentices of Trade Apprentice (Fitter)/Technician Apprentice (Mechanical): 3 years Diploma in Mechanical Engineering from recognized Institute/ University with minimum of 50% marks in aggregate for General & OBC candidates & 45% in case of SC/ST/PwBD candidates against reserved/ identified for PwBD positions or Matric with ITI in Fitter Trade with Pass class. Junior Engineering Assistant-IV (Instrumentation) ) / Junior Technical Assistant – IV: Ex-Apprentices of Technician Apprentice (Instrumentation): 3 years Diploma in Instrumentation/ Instrumentation & Electronics/ Instrumentation & Control Engineering from a recognized Institute/ University with minimum of 50% marks in aggregate for General candidates & 45% in case of SC/ST/PwBD candidates against reserved/identified for PwBD positions. Junior Quality Control Analyst- IV: Ex-Apprentices of Trade Apprentice (AOCP): B.Sc. with Physics, Chemistry/ Industrial Chemistry & Mathematics with minimum of 50% marks in aggregate for General & OBC candidates & 45% in case of SC/ST/PwBD candidates for identified positions. Candidates are advised to carefully read the full advertisement for details of educational qualification and other eligibility criteria before filling up application. Candidates are required to submit the application form (Attached as Anx A) along with the self-attested copies of supporting documents mentioned in the checklist (attached as Anx B), at the venue on the date of written Test. If application form along with supporting documents of a candidate is not received by IOCL, Gujarat Refinery at the venue on the date of written Test, his/her candidature shall be summarily rejected. Candidates are advised to carry a copy of communications received from IOCL, Gujarat Refinery with originals & self-authenticated copies of all testimonials and produce the same at the time of SPPT for verification. Incomplete applications, applications not supported by copies of relevant documents, applications not fulfilling the eligibility criteria or applications received after the date of receipt of applications shall be treated as “Rejected”. Further information regarding Venue of written Test, Venue of submission of documents, written examination, call letters, results, etc. shall be made available through this website/ over email. Candidates are, therefore, advised to keep visiting the website/email regularly. Canvassing in any form is liable to render the candidate ineligible. Queries, if any, may be addressed to Email ID: jr-recruitment@indianoil.in or Contact No. : 0265-2238154.